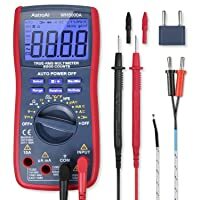 What is The Best Multimeter For Automotive Repair? Why Should You Buy An Automotive Multimeter? How to Choose A Multimeter For Automotive Use? How to Use An Automotive Multimeter? 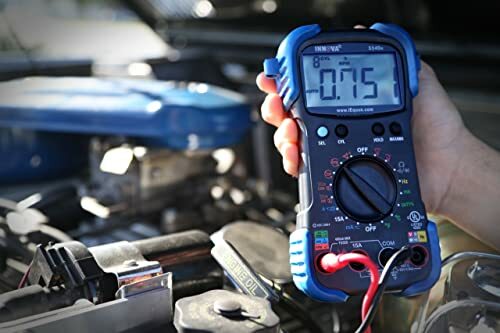 Are you a car owner who has finally decided to take things on your hands by using an automotive multimeter? Or are you a technician who works with car circuits and now looking for a highly-rated multimeter? If you are any of these incredible people, then you have come to the right place. Because today we are going to pick the best automotive multimeter for you by reviewing the top 6 models available in the market right now. Below are top 3 digital multimeters for automotive use that are the best at its price range. For more product recommendations, check the following automotive multimeter comparison table. Before we jump into the automotive multimeter reviews and buying guide, here is a list of the top six automotive multimeter models according to our in-house experts. We have tested all of them and have ranked them on the basis of factors such as usability, accuracy, and features. 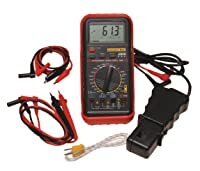 You can skim through these automotive multimeters or scroll down to read the detailed reviews below. So, without further ado, here are the top rated multimeters for automotive repair. The America-made Fluke 88 series is trusted by generations and is the top-rated and a very highly recommended automotive multimeter in the history of heavy-duty meters. Other than the fact that the 88V is manufactured inside the United States, this Fluke meter is designed to work flawlessly in high energy environments, especially in assembly-line industries that manufacture hybrid vehicles. This makes it an ideal choice for mechanics and master tech engineers. It is rated to measure voltage ranges of up to 1000V (600V for category IV) and can also detect temperature (thermocouple attached) and frequency changes. The Fluke 88V is really an auto mechanic’s companion because its capacitance measurement and availability of oxygen sensors elevates its appeal and capability. It just simplifies the task at hand, which would otherwise consume more time and effort. The Fluke 88V can withstand huge voltage spikes (the company manual says up to 8000V, which is a bit of an overstatement, to be honest), has a high-impact holster to save it from those accidental falls, and a magnetic hanger for hands-free troubleshooting. It’s a sturdy little meter that is the best thing you can depend on to diagnose electrical issues in your car. If accuracy and convenience are your main parameters then the Fluke 88V is your best bet. It is what professionals trust their electrical overhauling with today. The backlight and wide display are definitely the highlights of this Fluke model, which is the #1 choice for technicians of field work. The good thing about the Fluke brand is that it has managed to create a reputation for itself over the years, and which has, in turn, boosted its global sales. 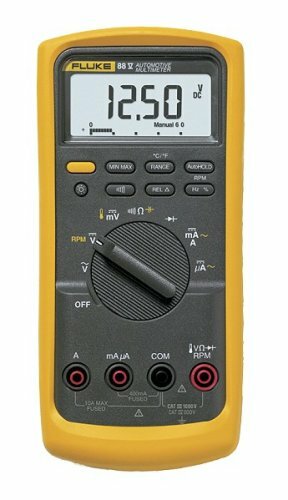 The ubiquitous “yellow” meter is a trademark now, which is why two of our top automotive multimeters are of this brand. Add to the capability of handling voltage ranges of up to 1000V, similar to the 88V model, this Fluke 77 is a bit faster than its cousins. The backlight lets you work in the dark, especially in places that are dimly-lit. (You will still need a flashlight to see where to plug the probes, right? Check out the Tacklife meter at #6!). It is a great solution for when you are working on house wiring projects and have to check the wiring in the attic area. The Fluke 77-IV is a modern version of the legendary Fluke meter and is a perfect tool for mechanics working on electrical motors and auto electrical troubleshooting. If you are an auto mechanic who works in dimly-lit areas and need a speedy companion for all your auto electrical troubleshooting tasks, then look no further. The 77-IV is a monster tool. Pro Tip – Make sure you register your Fluke meter immediately after purchase to avail its incredible customer support and warranty. Designed specifically for auto engine problems, the Innova 3340 is best known for its solid build and a wide display that is very bright and shows large values (prints), which makes it easier to note the measurements. If you are not a fan of Fluke, then consider Innova, the equally fabulous brand of electrical measurement tools. It came into limelight with its flagship 3320 model that is still considered one of the most inexpensive and accurate automotive meters to come out from the manufacturing industry. Apart from the usual electrical measurements, the Innova 3340, which is an upgraded version of the 3320 Plus, can test duty cycles, temperature, solenoids, and switches – all of which makes it a perfect tool for both DIYers and auto mechanics. What we specifically love is the hands-free approach (which is also available on the Fluke 88V), the RPM clamp, and a nifty carrying case. It shuts off automatically to save power when not being used for more than 10 minutes, which is a great add-on. The Innova 3340 is a professional tool loaded with amazing features meant for professional users. Therefore, it makes for a solid automotive meter for anyone whose entire work revolves around auto electrical troubleshooting. The low price tag, as well as the high safety rating, makes this ESI model a coveted tool amongst auto tech mechanics. While our top brand is and has been Fluke for a long time, we like to cut some slack to underdogs. ESI (Electronic Specialties Inc.) is one such brand that tries too hard and excels. The 585K automotive DMM is a great example of ESI’s capabilities of bringing all great features in a solid meter. It garnishes all the features with a dual fuse protection and excellent auto-ranging feature, which further elevates its stance in industrial troubleshooting. Whether you are a hobbyist who likes to meddle around with your 4-cylinder car engine or are an engineer who works at an auto tech, this smart tool is going to leave up to your expectations. It works on all – 1-, 2-, 4-, 6-, and 8-cylinder engines, measures almost all relevant quantities except capacitance, and is designed for professionals. There is nothing that can go wrong with this hybrid tool that also comes with great customer support. Verdict If you are on a budget and are looking for a decent meter that will do most of your auto electrical troubleshooting tasks, then this ESI model will not disappoint you. The 585K is a trusted tool, and only second to its upgraded version – the 585K Pro which also has the useful min-max mode. Low-cost automotive multimeter with 3 years of warranty, excellent customer support, and LCD backlight. For people who are looking for inexpensive meters yet want quality and precision, the AstroAI WH5000A is a good bet. It is the cheapest meter on the list so far, and despite that, can provide accurate, true-RMS readings. It can also measure temperature and capacitance (up to 60mF) and comes with a magnetic hanger. Although we tested the magnet to be fine while working on running engines, we do not recommend it for critical tasks for the fear of tripping. The safety rating is as good as the Fluke 77-IV with dual fuse protection and a sturdy enclosure. The only drawback that we found is the beeping feature – the meter beeps every time you press a button or use a function. Now, this is not a deal-breaker for DIYers and hobbyists but can be irritating to auto mechanics who work in industries and noiseless areas. Compare it with Innova 3340 above and this is the cheaper version of that meter with only a few features missing. Verdict AstroAI is a relatively new company that is looking to make a mark in the industry. The fact that it has created a nifty little meter for half the price of its competitors and which still gives out accurate readings cajoles us to recommend this to you. It will give a great bang for your buck! LCD backlight, flashlight, non-contact voltage (NCV) measurement, LED pulse lights, variable beeping sounds – we saved the best for the last! The Tacklife DM07 is by far the cheapest and the most power-packed automotive meter we have seen. The LCD backlight displays large digits on a widescreen while you are testing anything from voltage to capacitance (100mF) to temperature (different probes). If that was not enough, it also comes with a flashlight which can be used to measure in areas that are not properly lit. The LED pulse lights are great indicators of voltage presence through the NCV feature, that is not present in any of the above models. What makes it further interesting is the beeping sound that has variable frequencies according to the strength of the quantity being measured. Using this Tacklife meter is like having more fun and loving the job that you do. We certainly had great fun testing it, and therefore recommend it as one of the best automotive multimeters available on the market right now. For this price, it has no comparison at all. If you are tight on budget and yet want to have a fully-loaded meter, there is only one option. Buy the Tacklife and immerse yourself in an otherworldly troubleshooting experience. Above are the best digital automotive multimeters available in the market right now. While they have different features, one common thing between them is the high safety rating, which is not only essential but should be your number factor while purchasing. 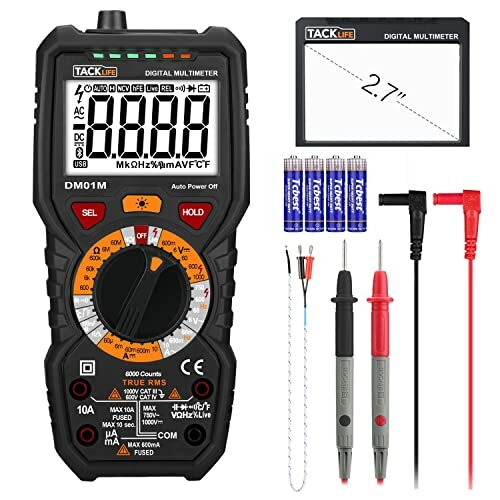 While Tacklife DM07 is the most inexpensive meter on this list, it is definitely high on features and accuracy. On the other hand, the Fluke 88V is, without a doubt, the best Fluke meter for automotive use that money can buy. Both of them are highly rated and are trusted by millions of professionals around the world. So, match your requirements with the buying guide and make your selection. Having a good-quality automotive multimeter can help you diagnose common electrical issues with your vehicle. One such example would be to test the battery of your car and check if it needs a boost or a replacement. All without depending on a mechanic. While you can do this with a general-purpose meter, an automotive multimeter ensures more safety and is rated for high voltages. If the high rating is not enough of an advantage, modern meters come with fabulous features that will turn you from a regular car owner to an enthusiast. Features like temperature measurement, automatic ranging, flashlight, and battery health check meter are some extra bells you can find in multimeters today. Therefore, it makes sense to make an automotive multimeter a part of your automobile toolkit. Compared to how much a car costs you, getting a multimeter will be a fraction of that cost. But in the long-term, it will pay off by helping you keep your car in spick and span condition. If you are still somehow confused about which one to buy, here’s a short buying guide that will help you make a perfect choice. In this guide, we will take you through a few important factors that you need to consider while choosing your meter, most common applications, useful tips and tricks, and frequently asked questions. Look at this section as an information desk for all your burning questions about automotive troubleshooting. There are several factors that need to be considered while shopping for an electrical meter. But with an automotive meter, it is slightly different. It basically combines different measurement functions into one. Safety Rating – Consider the usage and location. If you are going to use the meter in highly sensitive and static areas like production lines, you need to buy a meter that has a strong enclosure made of fiber and with a higher CAT rating. Most of the above meters are rated for CAT-IV (around 600V AC). For the highest rated meter in our list, go with the Fluke 88V Automotive Multimeter. Analog meters are almost like artifacts today, used only by a niche group who prefer those types. Digital meters are robust, more accurate and easier to read, and come with a plethora of features. Ranging – You can either go with auto-ranging or manual mode (like regular DMMs). Auto-ranging meters automatically detect the range of the quantity being measured and get you the exact value. Quantities – Look at what quantities the meter can measure. Are you going to be needing a tool that also measures temperature? Then get one with a thermocouple (Fluke 88V). Can’t think of a meter that does not measure capacitance? Don’t consider the ESI model. It is also important to check the maximum ranges. For example, if you want to measure voltages above 1000V, you might have to go with Pro versions of the Fluke meters reviewed above. Same goes for capacitance and frequency. Quality – This is a default parameter and one that you will not need to put efforts in. Our reviews of the meters above should give you a good idea about the make and build of the meters. All six are highly accurate, while only a few of them give a true-RMS reading. Jot down the top 5 features that you need and then get the meter that has a majority of them. This is the easiest trick in the book to find your ideal meter. Most of these applications revolve around measuring common electrical quantities. The key is to know what to check, when, and how. It is as simple as testing a 9V radio battery. You just need to connect the probes to the terminals of your car battery and select the range of 20V DC. Since most car batteries are in the 12V-15V range, this is a good range to select. If the battery is in good condition, the meter will read a value near to the original rating of the battery. If it does, move to the next step. Turn ON the ignition while keeping the meter probes connected to the battery. If the reading drops a few volts and then increases to stay constant, you can confirm that your battery is capable of generating cold cranking amps (CCA) essential for the running of your car. Read more: How to Check Battery With Multimeter? 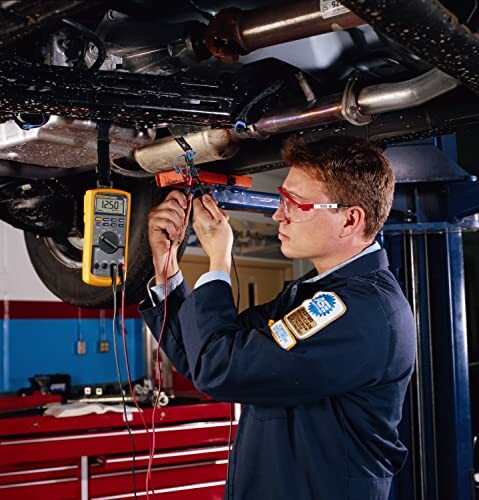 Find out the location of the coolant temperature sensor and connect the probes of your multimeter to its terminals. While the ignition is OFF, check the resistance of the sensor. It should be less than 3 kilo-ohms. Upon ignition, the resistance should drop to less than 1 kilo-ohm. If for any reason, these readings do not match, you may need to change the sensors or take your vehicle to an auto garage. Few automotive testers have manual instructions for such common tasks. So, it might be a good idea to read them before operating. 1 – How to measure current if a meter has different ranges? Most multimeters have two ranges for current measurement. The mA range can be used for low current measurements whereas A range (up to 10A usually) is used for high current measurements. Users should also note the rating if a meter can withstand continuous measurements of high current ranges. 2 – How to replace fuses? It is recommended that you do not meddle with the factory setting/enclosure of a meter. But in case of a blown fuse, you must switch OFF the meter and open it through the back cover. Take the blown fuse to your nearest electronics store and get a replacement, possibly of the same brand. Alternatively, you can get in touch with the manufacturer. 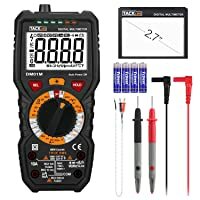 3 – Will I get a warranty if I purchase a meter from an e-commerce site like Amazon.com? Most meters come with a manufacturer’s warranty, which is valid regardless of the medium of purchase. Make sure you keep the invoice safely with you at least till the warranty period. Fluke and Tacklife are known to provide best customer support. 4 – How to check the highest range for measurement of any quantity? Checking the meter’s manual will be the best solution. Most meter manuals have complete information about the product. 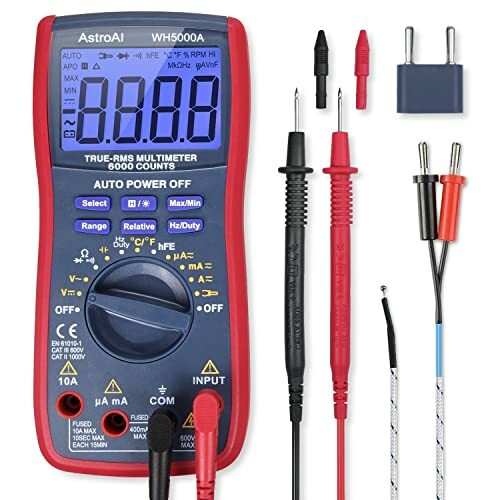 We hope that this guide has saved you time and helped you make a wise decision on the best automotive multimeter for the money. Here’s to industrial tools and modern technology! How to Choose the Best Multimeter?